I don't know about you, but I cannot live without my garbage disposal. It is one of the most important kitchen gadgets in my house. Seriously! We use it multiple times a day. That is why when my garbage disposal died a few months ago, I totally freaked out! I simply can not function in the kitchen without my garbage disposal. The garbage disposal that died was the original disposal that the builder installed. It was never the best quality. It wasn't powerful enough for our kitchen. I did some research and decided to upgrade to an InSinkErator Garbage Disposal. Through my research on the internet, I learned a lot about garbage disposals. A lot! For starters, there are no blades in a food-based disposer. Contrary to popular belief, it does not act like a blender. Once food waste enters a disposer, it falls onto a rotating shredder plate – and this actually does most of the work. The plate spins and knocks the food around, breaking into little pieces. The centrifugal force of that spinning plate then throws the food waste against the walls of the disposer chamber, which look a lot like a cheese grater. I spent a lot of time looking over all the different models InSinkErator offered. InSinkErator has two lines of garbage disposals. The Badger and The Evolution Series. Both are great and get the job done. The main difference is the capacity and the sound level. We had to go with either the Badger 5XP or an Evolution Series because we wanted at least a 3/4 HP motor. I wanted something with a lot of power, that would be quiet and was affordable. We aren't on a septic tank, but there is an option for an InSinkErator garbage disposal for those of you that are on a septic tank. 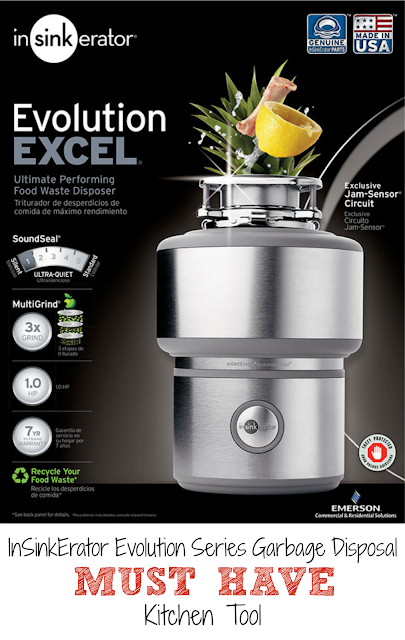 I eventually picked out the InSinkErator Evolution Excel. It was less than $400. I chose the Evolution Excel because I cook so much and use my garbage disposal multiple times a day. I wanted the biggest motor available. I also considered the InSinkErator Evolution Compact, but decided it was worth the little extra money for the extra power. The Evolution Excel is able to grind everything from artichokes to rib bones. It grinds bones - bones, y'all! Crazy!! You can throw vegetable peels down there too. It is also super quiet! You can have a conversation in the kitchen while the InSinkErator Evolution Excel is running! At our house everyone gathers in the kitchen. I love that I can quickly clean up and not disrupt the party. 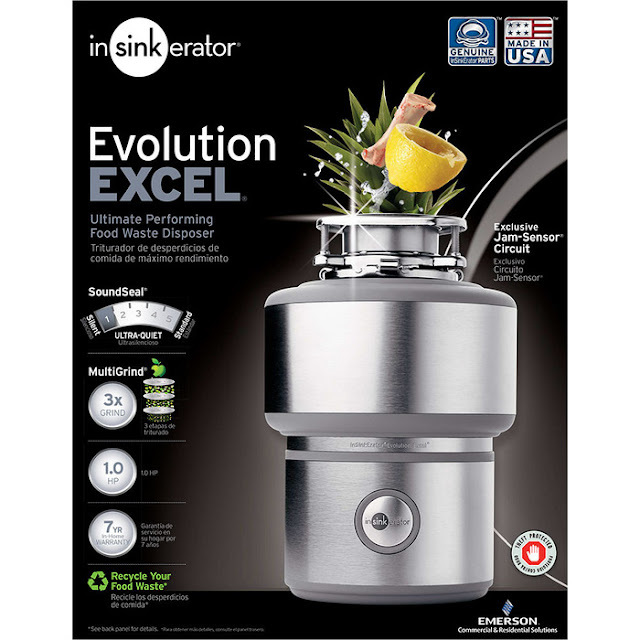 The InSinkErator Evolution Excel is super easy to install. They have great video instructions that walk you through each step on the InSinkErator website. If Chicken Legs were even the slightest bit handy he could have installed it for us. Unfortunately, there isn't a handy bone in that man's body. SO, Chicken Legs called a plumber and it only took the plumber a few minutes to remove the old garbage disposal and install my awesome new InSinkErator Evolution Excel. I was back in business in no time!! I know it sounds weird, but I love the new garbage disposal! It is SO much better than the one the builder installed. I love that it will grind up everything. It makes cooking and clean up so much easier. We just throw everything in the disposal and grind it up. Easy Peasy! They have something for everyone and every budget. Want to upgrade your garbage disposal? 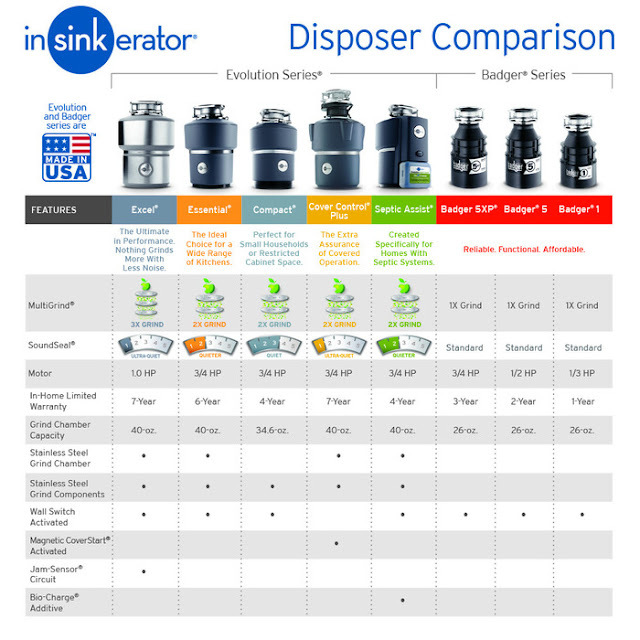 Enter to win a an InSinkErator Evolution Series Garbage Disposal! Use the PromoSimple widget below to enter for a chance to win. You can enter once a day. The giveaway ends on Friday, October 1, 2015 @ 11:59pm CDT. The winner will be contacted via email and has 48 hours to respond. If the winner does not respond within 48 hours, a new winner may be selected. The product will be shipped from InSinkErator to the winner's address. **If you are viewing this post via email or a RSS reader, you may need to come directly to the blog post to enter for a chance to win. You have the coolest giveaways! Our garbage disposal (a very basic model) is on its last leg and I have no idea what I'm going to do when it finally kicks the bucket. Good luck to everyone! This would be an awesome giveaway to receive, as we are in the framing process of our house & right now one is not planned for us!